You are here: Home / Mobile / Did you hear what I said? Here’s what I want from a Bluetooth headset: (a) you can hear me, (b) I can hear you, and (c) hassle-free phone pairing. For those of us who rely upon these devices, it’s tough to find happiness. And, it’s difficult to comprehend the experience of the other person on the line, the one who is supposedly listening to the conversation. It’s on item (a) that many headsets fall below expectations, but unless you ask, you have no way of knowing what the other person is (not) hearing. I decided to experiment with two of the most highly-rated Bluetooth devices. Blue Ant's Q2 looks great in any color. It's small, well-designed, and sounded good to me. Sure enough, I fell in love with its small size and wonderful incoming sound quality of the nifty Blue Ant Q2. Pairing with my iPhone: easy. Noise cancellation: in theory, great, in practice, not so great (even a gentle breeze was a problem). 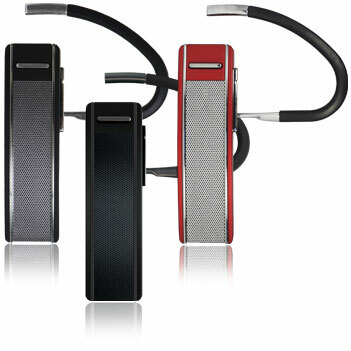 Fit and style: terrific; the device just hooks over the ear and looks sleek. Little button to press when making or receiving a call: sometimes, a bit hard to find, but okay with practice. Several voice control features added to a positive experience: terrific! I can ask the phone, “am I connected?” or to “redial” or to repeat all available menu commands. Finally, here’s a smart device that sounds good, looks good, and works properly. Or so my great expectations imagined. When I started asking people how I sounded, the comments were, at best, noncommittal and often, negative. Most often, I was told that the sound was “a little weak” and that they were hearing “some but not all of the words” and that they heard “a lot of background noise.” The more negative comments I heard, the more I experimented–trying different locations, different phones, interior, exterior, quiet, slightly breezy, in cars and trains, out walking the dog, etc. No change in the comments I received. Since I could hear the other person so clearly, at first, I questioned the other person’s phone system, ears, sanity, whether they were using an inadequate phone or earpiece on their end, and so on. More than a month’s calls led me to the sad conclusion: although I could hear the other person, they could not hear me, not clearly, and, often, not completely. So, I continued my Goldilocks routine by returning to an headset I had used before with some complaints. I liked the clunky big-battery-behind-the-ear, big-boom-microphone Plantronics PRO when I owned a previous model, but the incoming volume was unacceptably low. For most of February, I’ve been using the newer PRO HD, and found two improvements much to my liking. The first improvement is a better incoming sound system: every call is loud enough, and every call is clear. The second: I like the sensor that tells the headset when it is actually on my ear (if it’s not on my ear, it won’t take the call; if it is on my ear, it will answer calls automatically without requiring me to press a button). Of course, the big test is not what I can hear, but what you can hear when you call me. I was really hoping for good results on that score–and sure enough, the PRO HD came through. Several people asked me whether I was actually on a headset because the sound was so clear. So far, not one person has complained about sound quality. For me, that’s extraordinary; I’ve been hearing complaints about my Bluetooth headsets for years. Wind noise? Yeah, that’s still there. Better than the Blue Ant Q2, but a breezy day is a problem for an exposed microphone. On the Pro HD, the boom microphone is long and large enough to accept the equivalent of the wind muffle that location video shooters use–a soft furry condom to catch the wind–maybe that teeny accessory is on its way? And while we’re on the topic of accessories, even the PRO HD is really small, and really easy to lose. I sure wish Plantronics would develop some sort of carry-everywhere accessory to minimize the loss of its $100 device (so far, I’ve lost two of them). This blog post is already on the long side. I’ll review Blue Ant’s Q4 speakerphone in a separate article.